Does anyone know of any breeding red kites in Shropshire? 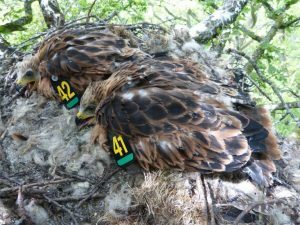 If you see evidence of breeding Red Kites in Shropshire, we would like to know, please. Red Kites almost became extinct in Wales in the 1930’s, but the population slowly increased, reaching 100 pairs in 1993. They have spread since then, and two pairs nested unsuccessfully in Shropshire in 2005. One pair fledged two young here in 2006, the first successful breeding in Shropshire for 130 years. Six nests were found in 2007, and, by 2010, the population had reached 20 breeding pairs. Numbers have continued to increase. In 2016, 24 pairs were located, and 23 nests were found; 18 were successful, producing 31 fledged young. (See full report here). Since the first successful breeding in 2006, more than 200 young are known to have flown from Shropshire nests. 180 of these young have been tagged as part of a long-term study. Almost all found nests have been in the AONB in the south-west Shropshire hills, but the range is spreading, and there have been nests near Chirbury, and along Wenlock Edge and near the Clee Hills, in the last four years. As the range increases, they are harder for us to find, so reports from the rest of the county are particularly important, please. Kites usually don’t breed until they are two or three years old. Young birds wander widely, so many sightings will be of immature birds. However, there should be even more nests to find this year, including some in north and east Shropshire. Most nests are started in late March, but first-time breeders may not lay until late April or early May. Nests are usually built in large trees, on steep hillsides. Young fly in late June or early July. Nest sites are kept confidential. We are still trying to find all nests, so reports are wanted, please, of a pair together in spring, or displaying, or one seen several times in the same place, or one going into a wood, any time between March and June. Reports of wing-tagged birds are wanted too, please. All reports will be treated in absolute confidence. Kites are very shy, and they are legally protected. It is an offence to disturb them, but this monitoring is carried out under licence. We aim to wing-tag more than 20 nestlings in 2017, so finding as many nests as possible this year is particularly important. This is the final year of the tagging study and we hope to increase the sample of tagged birds to over 200, so any help is gratefully received. Posted on February 28, 2017 February 28, 2017 Author PaddyKTLeave a comment on Does anyone know of any breeding red kites in Shropshire? The latest Welsh Kite Trust newsletter – Boda Wennol Issue 29 is available to view or download here. Newsletters are now published on the website to reduce administration costs which has begun to escalate. With mild weather forecast to continue through to the end of February, it is likely that many red kites will already be pairing up and hanging around their intended nest sites. They will often draw attention to themselves by their plaintive whinnying call, as was heard yesterday near a nest in Pembrokeshire that was used successfully in 2016 season. 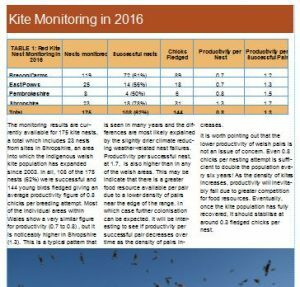 In 2016, WKT volunteer nest watchers managed to record the nest outcomes of 175 kite nests at widely scattered locations and these results are presented in the downloadable PDF file below. 2016 was an unremarkable breeding season for kites, being not especially good or bad, but how will they fare in 2017? It is already the time to get busy looking for this year’s nests. NB red kite is a schedule 1 species requiring a disturbance license to monitor nests. It otherwise illegal to disturb breeding kites at the nest.